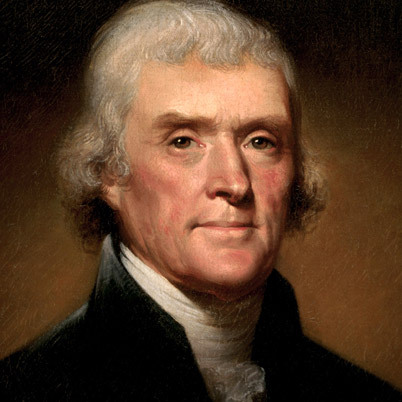 President Thomas Jefferson in a portrait by Rembrandt Peale. Racism has been a consistent thread weaving through the American Right from the early days when Anti-Federalists battled against the U.S. Constitution to the present when hysterical Tea Partiers denounce the first African-American president. Other factors have come and gone for the Right, but racism has always been there. Though definitions of Right and Left are never precise, the Left has generally been defined, in the American context, by government actions -- mostly the federal government responding to popular movements and representing the collective will of the American people -- seeking to improve the lot of common citizens and to reduce social injustice. The Right has been defined by opposition to such government activism. Since the Founding, the Right has decried government interference with the "free market" and intrusion upon "traditions," like slavery and segregation, as "tyranny" or "socialism." This argument goes back to 1787 and opposition to the Constitution's centralizing of government power in the hands of federal authorities. In Virginia, for instance, the Anti-Federalists feared that a strong federal government eventually would outlaw slavery in the Southern states. Ironically, this argument was raised by two of the most famous voices for "liberty," Patrick Henry and George Mason. Those two Virginians spearheaded the Anti-Federalist cause at the state's ratifying convention in June 1788, urging rejection of the Constitution because, they argued, it would lead to slavery's demise. The irony of Henry and Mason scaring fellow Virginians about the Constitution's threat to slavery is that the two men have gone down in popular U.S. history as great espousers of freedom. Before the Revolution, Henry was quoted as declaring, "Give me liberty or give me death!" Mason is hailed as a leading force behind the Bill of Rights. However, their notion of "liberty" and "rights" was always selective. Henry and Mason worried about protecting the "freedom" of plantation owners to possess other human beings as property. At Virginia's Ratification Convention, Henry and Mason raised other arguments against the proposed Constitution, such as concerns that Virginia's preeminence might not be as great as under the weak Articles of Confederation and that population gains in the North might erode Virginia's economic welfare. But the pair's most potent argument was the danger they foresaw regarding the abolition of slavery. As historians Andrew Burstein and Nancy Isenberg wrote in their 2010 book, Madison and Jefferson, the hot button for Henry and Mason was that "slavery, the source of Virginia's tremendous wealth, lay politically unprotected." At the center of this fear was the state's loss of ultimate control over its militia which could be "federalized" by the President as the nation's commander in chief under the new Constitution. "Mason repeated what he had said during the Constitutional Convention: that the new government failed to provide for 'domestic safety' if there was no explicit protection for Virginians' slave property," Burstein and Isenberg wrote. "Henry called up the by-now-ingrained fear of slave insurrections -- the direct result, he believed, of Virginia's loss of authority over its own militia." "Congress, if it wished, could draft every slave into the military and liberate them at the end of their service. If troop quotas were determined by population, and Virginia had over 200,000 slaves, Congress might say: 'Every black man must fight.' For that matter, a northern-controlled Congress might tax slavery out of existence. "Mason and Henry both ignored the fact that the Constitution protected slavery on the strength of the three-fifths clause, the fugitive slave clause, and the slave trade clause. Their rationale was that none of this mattered if the North should have its way." At Philadelphia in 1787, the drafters of the Constitution had already capitulated to the South's insistence on its brutal institution of human enslavement. That surrender became the line of defense that James Madison, a principal architect of the new governing structure, cited in his response to Mason and Henry. "Madison was doing his best to make Henry and Mason sound like fear-mongers. Yet Mason struck a chord in his insistence that northerners could never understand slavery; and Henry roused the crowd with his refusal to trust 'any man on earth' with his rights. Virginians were hearing that their sovereignty was in jeopardy." Despite the success of Mason and Henry to play on the fears of plantation owners, the broader arguments stressing the advantages of Union carried the day, albeit narrowly. Virginia ultimately approved ratification by 89 to 79. However, the South's obsession over perceived threats to its institution of slavery remained a central factor in the early decades of the Republic.